We’re excited to offer a range of local and international shipping options. If you want to upgrade your shipping method, please contact customer service. You are able to upgrade your shipping until your jewelry begins the “shipping” stage. Shipping method pricing varies depending on service option. For more information about local and international shipping as well as relevant delivery times during peak seasons please click here. We want to give you a transparent shopping experience. Therefore, we provide you with the ability to track your order status from the time you place your order all the way until it is delivered to your door. If you would like to change your address before your order is shipped, please contact us and we will update the address in your order accordingly. We can change your shipping address for you until your item is packed for shipping. It is best to contact us immediately to avoid any delays. Once you place your order, we are working really hard on your order for it to be perfect. Your order is produced according to the shipping method you chose upon placing your order. If you have not received a shipping notification, this means your order is still in production. Click here to track your order status. When your product is on its way, you will be sent a shipping confirmation email. This will state your delivery date and tracking number depending on the shipping method you chose. Check your shipping details on the order confirmation and make sure they are correct. Orders are sometimes left there by the Post. Ask your local post office if they can provide any further information on the whereabouts of your package. Be sure to have your tracking number with you on hand. If your order is being shipped outside the U.S, the shipping timeframes may be different. We're sorry to hear that an item is missing!! We ask that you please check your order details on your order confirmation to make sure that the details are correct and as you ordered. If your order has been sent in different parcels, each delivery note will tell you the items you can expect to find inside. If an item is missing, please contact customer service team with your order number, the missing item's name and a link to the item's webpage will help. We will resolve this issue for you as quickly as we can. Although it is rare, sometimes your tracking number will say "Delivered" before your package has arrived. Some packages travel through multiple carriers; check your mailbox other locations you receive mail. Our team is dedicated to providing you with any assistance you may need. As an online company, we work best with online solutions. Before you contact us, did you know that you can resolve many issues on your own with our Help Center? If the answers suggested don't solve your issue, you are able to contact us directly here to email our customer service representatives. For a more immediate response, you can send us a message on one of our social pages, Facebook or Instagram. Staying online also means that we can stay available for you 24 hours a day, 7 days a week, and 365 days a year! This makes it easy for you to get in contact with us. While we do not have a call center capacity to receive phone calls, we will happily contact you if necessary. Please feel free to search through our FAQ's or contact our support team here (custserv@oakandluna.com). At Oak & Luna, we accept all major credit cards as well as payments made through PayPal. All payments must be paid in full before shipment. In order to place a payment, simply click on either the "Continue to Checkout" or the "PayPal Checkout" buttons in the shopping bag. After you have entered your contact details, you will then be redirected to the relevant payment platform. So, you have looked through our site and want to purchase an item? Great! Click on the product you would like to purchase to proceed to the product’s page. There, you can find information regarding description, customizable options, and product dimensions. Each product page will have a menu on the right hand side that will guide you in finalizing your personalization. Each box will give you the option to enter each part of your customization. This may include choosing your material, writing your inscription (be sure to take note of character limits), choosing stones or even deciding on your chain length. Once you have completed your customization where applicable, click “ADD TO BAG”, and you will be redirected to your shopping bag ready for checkout. Once you have arrived at your shopping bag, you can confirm that all of your order details are correct. If you have a Promo Code, this is the place to enter it to redeem the discount. Once you are satisfied with your order, you may click “CONTINUE CHECKOUT”, which will take you to the contact information page. Here you will fill out your basic contact details and then, again, click “CONTINUE CHECKOUT”. The next page will be where you enter your payment & shipping information. Once you have successfully completed this page, you will be sent to a confirmation and thank you page and your order will be sent to production! You will also receive an order confirmation email with your order details and shipping information. Subscribers to our newsletter and other customers who follow us on social media often receive discount codes. In order to redeem your discount, simply add the products you would like to purchase to your shopping bag. In your shopping bag, beneath your item information, you will see an option to enter your promotional code. Click this button and a box will drop down where you can type in your promotional code. Once you click “APPLY”, your discount will be subtracted from your subtotal. Only one promotional code can be used at a time. If you are having problems with your promotional code, please click here for more information. If you are having issues redeeming your discount, you may have entered the wrong promotional code or your code may have expired. Please make sure you write the promotional code in the exact same way it was given to you, without any spaces. If your promotional code is not working, please contact our customer service to resolve the issue. At this time, only one promotional code may be used at a time. For more info on how to use your promotional code, click here. If you received a message that your payment did not go through, please check your billing information and personal information. Make sure the information you have entered matches the card. If all details are correct, please try to pay via PayPal. Don't worry, you don't have to be a registered member of PayPal to use their services. You can also use a different credit card or try simply try again with the payment process a few hours after your initial attempt. If you are unable to complete your payment using PayPal, please contact us with your order details. We will gladly send you an e-mail with a PayPal Payment Request in order to complete your payment and process your order. Sometimes, there is a slight difference between your actual email address and the one you made your order with. (Typos- we all make them!). The email may have been sent to your spam / junk / promotion folder. Look into these folders and find the email. You can also search for our email address CustServ@oakandluna.com and hopefully it will show up in the results. Mark our domain as “Not Spam” in your email service. Allow 24hrs for our team to release the order into a confirmed status. If you are still unable to locate your confirmation email please contact our team and we will be sure to resend it to you. You can find out your Order Status here. If you have already placed your order, but you selected the wrong product or want to change the personalization details, please contact our customer service team. Any changes made to an order before it is shipped will happily be accommodated, free of charge. If you are changing the item with a monetary difference, we will send you either a money order or refund, according to the difference. For custom items, changes made after an order has shipped will incur a 30% restocking fee due to the one of a kind nature of the product. Once your order has proceeded to 'Manufacturing', we can still change your order but your delivery date might be delayed. How Do I Change My Customization? If you have already placed your order, but you selected the wrong product or want to change the personalization, please contact our customer service team. We will be more than happy to modify your order details for no additional fee, as long as it has not yet shipped. Once your order has been confirmed and approved, you will be able to see the charge on your billing statement. 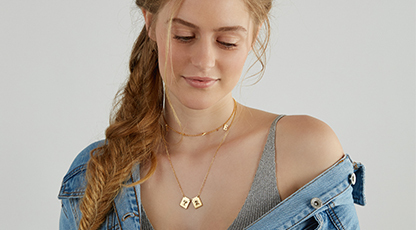 You can find us next to the purchase amount under the name "Jewelry Website / Oak and Luna"
Our chains run from 14" to 32" long, which means your necklace can sit anywhere from high up on your collarbone to all the way on your lower chest. Once you've decided where you would like the necklace to sit, take a long piece of string and loop it around your neck. Close the string at the point on your chest you would like your necklace to sit. Now open the string and measure it - how many inches is it? That's the length you should select for your new necklace. Keep in mind that the chain lengths mentioned on the website do not include the length of the pendant. For custom pieces, please keep in mind the total length will be the chain length plus your custom pendant. Most of our pendants run between 0.75"-2" (2-5 cm). For example, if you order a necklace with your name on it with a 16" chain, the total length of the pendant necklace would be 16.75" - 18", depending on the name and style. How to Determine My Bracelet length? To measure your wrist size, you can follow either one of the two simple methods in the images below. Both measurement options will provide you with an accurate measurement of your wrist size. Wrap a plain thin strip of paper around your wrist just below the wrist bone. Mark with a pen or pencil where the paper overlaps on your wrist, and measure the strip of paper up until this mark. On every product page you can find the width of the pendant and the available chain length. Please choose the chain length size that is closest to your determined chain length, we recommend that you round 1 size up when the measurement is not exact. Keep in mind that the chain lengths mentioned on the website do not include the length of the pendant. Please check the instructions tab on the product page. Take a look at our Ring Size Guide and Measurements Chart below. 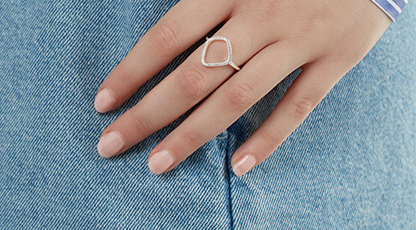 If you need additional help getting your ring measurement, keep reading. To measure, you'll just need a strip of paper, a ruler, and a pen or pencil. 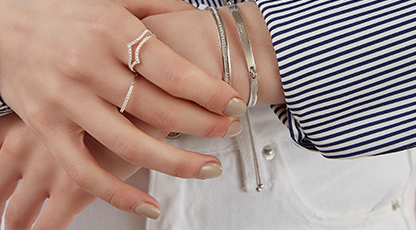 Wrap the paper strip around the widest part of the finger your customized ring would sit on. The widest part of your finger may be at the joint. Mark the point on the paper where the strip forms a complete circle and begins to overlap, with a pen or pencil. Measure from the edge of your paper up to the line you just marked with a ruler. Measure up to the nearest millimeter, rounding up if necessary. Using that measurement, use the chart below to find your ring size. So you want to request something a little extra? Get in contact with our Customer Service Team with a link to the item you are referring to, or the product ID number. They will reach out to our designers and check to see if it’s possible. The product ID number can be found on the product page. My Chain Size Is Incorrect, What Should I Do? If the chain length you received is different to the one you ordered, we will gladly send you a new chain, which can be easily replaced by yourself with a set of pliers. If you ordered the wrong chain length and would prefer a new chain, please contact our Customer Service Team and we will gladly ship a new chain to you, at no extra charge. The product information is located on each product page under the "Size & Material" tab. This section includes the material, thickness, and measurements of that specific item. The pendant length varies according to the inscription. The average size of a name plate ranges from 0.75"-2" (2cm-5cm). If you are unable to find the information you are looking for, please don't hesitate to contact our customer service. You can find chain information on our product pages. Generally, we use a Rollo chain for most of our jewelry. The chain is the same material as the pendant. For example, if you select a rose gold plated necklace, the chain will also be rose gold plated on sterling silver. 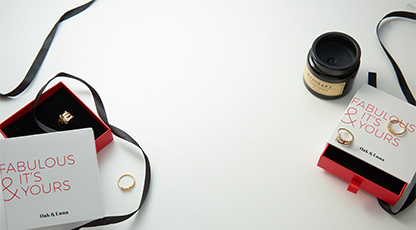 When you receive your jewelry, you will be able to find a stamp of authenticity on it. For our Sterling Silver items we use only 0.925 Sterling Silver. All of our Gold items are made of real solid gold. You can find the information about the specific item on the product page under the "Size & Material" tab. Yes, all our products are 100% nickel-free. We recommend specially requesting double thickness for customized pieces with 13 characters or more. 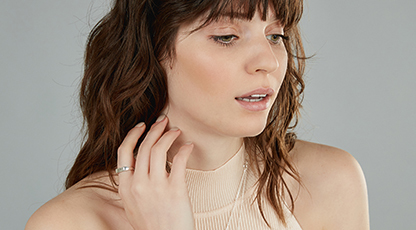 If you would like a name necklace with double thickness but cannot find it in our site, please contact our Customer Service Team, who will consult with our product design team to see if this special request is possible. How Can I Add A Stone Or Diamond To My Jewelry? We offer a variety of jewelry in which you can customize with stone or diamonds. If you see an item you like that does not have that option, please contact us to find out if that request is possible. Can I Order My Custom Jewelry In Other Languages? If there is an item in our site that you would like, you will need to contact our Customer Support Team to see if this special request is possible. How Can I Order Custom Jewelry With Special Characters? You are able to add special characters to your jewelry on the product page. We can add most characters to our jewelry, if it appears on the English keyboard. Sorry, emoji characters aren’t available at this time. Left initial is your first name. Center (large) initial is your last name. Right initial is the middle name. For example, if your name is Natalie Gemma Johnson, your monogram would be NJG. When applying perfume, take off your jewelry. An easy way to refresh your silver is by using a jewelry polishing cloth. This will remove any tarnish and smudging that may occur. Polishing cloths are widely available at jewelers and pharmacies. For extra cleaning we recommend using silver polish! When you are not wearing your silver jewelry (to shower or sleep), we suggest storing each piece individually an airtight plastic bag. This makes it easy for you to get in contact with us. While we do not have a call center capacity to receive phone calls, we will happily contact you if necessary. Quality is a value we guarantee at Oak & Luna. If you receive jewelry from us that is damaged, defective, or unsatisfactory in any way, let us know immediately. Our team will work with you to either refund the item or offer an exchange. Please get in touch with our customer service team. If you find that your ring size is incorrect, we will gladly resize once to any size for free! Check out our ring size guide and let us know which size is your correct size. Then, contact customer support and they’ll let you know your next steps. If this occurs, we will do our best to sort this out right away. Please check your order details to ensure that the order was placed correctly with the customization that you chose. We ask that you please contact our Customer Service team with your order number and a picture of the incorrect item. We'll send you a replacement item as quickly as we can. If you've returned your order, please allow an extra 4 working days for your return to be completed. Keep an eye on your inbox - we'll send you an email as soon as it’s in the works.